Sometime during 1977-78,in the august presence of His Holiness,the Paramacharya of Kanchi Kama Kothi Peetham,Sri Chandra Sekharendra Ssaraswathi,a large spiritual conference was being held at the holy Kanchi Mutt.. Attended by many amazing Hindu religious personalities who had come to Kanchi from many parts of the world,this spiritual congregation was a much talked about one those days..
On the final day of this one of it’s kind religious congregation,a “Veda Pravachanam” was conducted by a group of well learned Vedic scholars who were specially invited to this rare occasion from all over the country.. 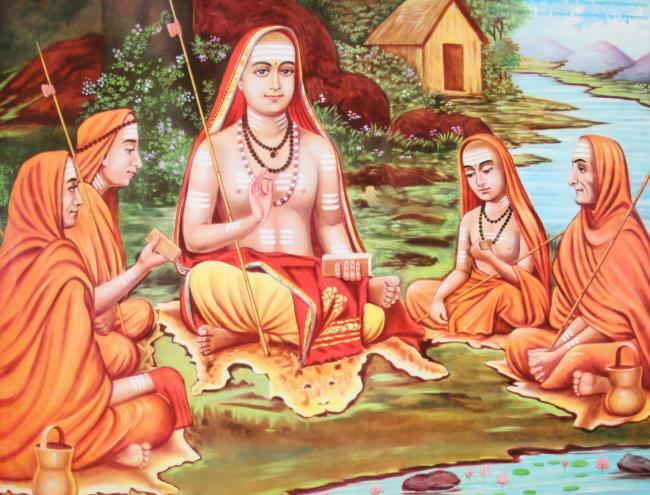 This particular scholarly group of Vedic geniuses was headed by two renowned Vedic scholars from the most accomplished Telugu land of Visakhapatnam.. While one of these two great Vediac scholars was the illustrious Brahmasri Sreepaada Krishnamurthy Ghanaapaati,the other one was his elder brother and the more illustrious,Brahmasri Sreepaada Sriram Ghanaapaati,who is also called “Apara Saraswathi” by hundreds of his ardent followers.. In the presence of His Holiness,the Paramacharya of Kanchi Peetam and other glorious spiritual personalities and holy Peetadhipathis,the final program of the”Veda Pravachanam” began in the holy Kanchi Mutt..
What started as a small flow of Vedic stream went on to become a small pond later and then on to a lake and then on to a river and then on to a sea and finally on to an ocean of Vedic fire lit by the amazing and spell binding Vedic rendition of those two illustrious Sreepaada brothers.. Believe me,the impact of that amazing Vedic rendition by the two learned brothers was so much that many spiritually enlightened personalities,who were among the august audiences that day,have virtually seen Goddess Saraswathi Devi dancing in the midst of their presence,there.. Impressed with the glorious recitation of the holy Vedas by the two brothers of Visakhapatnam,the five elements of Nature too have expressed their joy by showering their blessings on them..As a result there was a sudden heavy downpour in and around Kanchi Mutt,that evening..
At the end of that glorious Vedic rendition by the two brothers and their able followers,all the scholarly audiences,all the holy personalities,all the saints and all the most revered Peethadhipathis,who have thankfully witnessed that scintillating “Veda Pravachanam” that evening,have stood up in their honor and blessed them chanting the ‘aasirvachana manthras’..
However,the most impressed among all those gathered there was His Holiness the Paramacharya of Kanchi Himself who was just unstoppable that moment.. The two illustrious Sreepaada brothers have jointly conducted the “Veda Pravachanam” in many parts of India and also around the world and have thrilled the audiences,wherever they have performed,with their spell binding rendition of the Vedas.. In a way the two Sreepaada brothers have become standing testimonies to the power of Vedas,those days..
However,as fate would have it,the two beloved brothers after some time had a rift among themselves,for some unknown reasons,and have thereafter have never performed together on the same platform,again..
Day by day,the void spaces between the two warring Sreepaada brothers have grown wider and deeper and after some point of time the two wise brothers have very unwisely cut off all their relations with each other’s families and have in fact stopped inviting each other for even important functions in their houses .. This unholy war between the two great Vedic scholars went on for almost twenty five years until one day in October,2002 our mystic Brahmin,Nemani Subbarao along with his friend Veerabhadram visited the residence of Brahmasri Sreepada Krishna Murthy Ghanaapaati in Visakhapatnam to invite him to his house to perform “Veda Swasthi”.. Blessing Subbarao,Sri Krishnamurthy said,”Well said..Thank you very much..”..
“..Brahmasree..My name is Nemani Subbarao..Am also a resident of Visakhapatnam city..With the divine blessings of Mother Goddess Gayathri,I have recently completed one crore time recitation of the Gayathri Manthra..
Saying so,Subbarao paused for a few seconds and then looked at his friend,Veerabhadram and then at the face of Sri Krishnamurthy..
A puzzled Sri Krishnamurthy kept staring at Subbarao waiting in all eagerness to hear what he was about to say..
Veerabhadram was shocked at the audacity of his friend..With his eyes popping out,he just kept staring at his beloved childhood friend..
On the other hand,a much embarrassed Vedic scholar Sri Krishnamurthy,who was not prepared to receive such an unusual request from somebody whom he was seeing for the first time in his life,kept silent for a few seconds.. “..I don’t have any problem to share the dais with my illustrious brother Subbarao garu.. After all he is my brother..He’s also more learned and more scholarly than me but honestly I cannot guarantee the same response from him..
Saying so Sri Krishnamurthy immediately picked up the phone and called his brother.. Surprised with the sudden unexpected call from his brother Krishnamurthy,whom he would very fondly call Krishnudu,Sri Sreeram remained silent for a few seconds unable to know how to respond to his call..
Later,he quickly replied saying,”Am fine brother..How are you all..”..
Saying “Fine” Sri Krishnamurthy briefed his brother about the reason behind his call..
Saying so,both Subbarao and his friend Veerabhadram took leave from Sri Krishnamurthy and left for their respective houses.. The most auspicious day of the Veda Swasthi,which the noble couple of Subbarao and Venkata Lakshmi were eagerly waiting,had arrived..
On that day,the couple woke up early in the morning and launched their daily routine..While Venkata Lakshmi began preparation of food items for the day,Subbarao sat for his daily meditation of the sacred Gayathri manthra..
By 7.15 a.m the couple finished their respective works and kept the entire house ready for the auspicious Veda Swasthi pravachanams..
After about five minutes,Sri Mushty Venkateswara Ghanaapaati,the ‘Aasthaana Veda Vidwaan” of the famous Kanaka Maha Lakshmi temple in Visakhapatnam too arrived . That means four of the five Ghanaapaatees,invited by Subbarao,have already arrived by 8.15 a.m..
And only Sri Sreeram Ghanaapaati had to come however no one,except Subbarao,was sure about his coming that day..Waiting in anticipation of the arrival of Sri Sreeram; Subbarao and Veerabhadram stood at the main entrance of Subbarao’s residence.. Still after waiting for fifteen minutes,the two friends didn’t find any trace of Sri Sreeram’s arrival there.. In spite of so many discouraging words from almost everyone around him,Subbarao still decided to wait at the main gate of his residence,for a few more minutes,to receive Sri Sreeram Ghanaapaati..
Subbarao was waiting..It was 8.41..Subbarao was waiting..It was 8.42..Subbarao was waiting..It was 8.43..Subbarao was waiting..It was 8.44..Subbarao was waiting..It was 8.45..In spite of so much of waiting by Subbarao,Sri Sreeram Ghanaapaati did not turn up..
A much disappointed Subbarao turned back and decided to go into the house..
And exactly at that moment.. The man who did not turn up for twenty five years and the man who did not consider any request placed before him for twenty five years and the man who is considered “Apara Saraswathi” by his followers; that man; that great Vedic scholar,Sri Sreepaada Sreeram Ghanaapati has arrived in his car at the main gate of Subbarao’s residence..
Subbarao too quickly prostrated before his feet and took his blessings..
And then occurred the most emotional incident the entire city of those days Visakhapatnam was waiting eagerly to witness for twenty five long years..
Sri Krishnamurthy,who heard about his beloved brother Sri Sreeram’s arrival at the gate,quickly came out of the house and went straight to his brother and with tears rolling down his cheeks embraced him with all the warmth in the world.. There was not an eye that didn’t go wet there and not a face that didn’t wear a smile that moment..
Reciting many Vedic verses including ‘Aswamedham’ and ‘Arunam’ from ‘Yajurveda’,the two scholarly Sreepada brothers,along with the three other renowned scholars,have enthralled a few invitees there in Subbarao’s house..
That scintillating Vedic saga went on for a pulsating two and half hours time mesmerizing each and every individual present there..
With that mesmerizing Vedic rendition of the two Sreepaada brothers and the other three Ghanaapaatis, everyone there could virtually see ‘Veda Maatha’,Goddess Gayathri dancing in the midst of them but it was only Subbarao who could literally feel Her presence there..
Subbarao,then.soulfully thanked Goddess Gayathri for keeping up HER promise of dancing during the ‘Veda Swasthi’..
That was the last time the two great illustrious Sreepaada brothers have recited Vedas together on a single platform..Not because they were not invited by any one else to recite the Vedas..Not because the two wise brothers once again had a rift between them.. But because the two glorious brothers,the two great Vedic scholars,the two most illustrious personalities of the Telugu land,within a gap of few days,have left this human world and traveled to that undiscovered divine nation from whose bourn no traveler has ever returned..
Lastly,a few questions that may never find answers..
Who created that rift between those two brothers..? ?..Who kept them separated for twenty five long years..? ?..Who brought them together again after twenty five years..And finally Who took them away after that scintillating performance in Subbarao’s house..?? Were they brought together to perform only at Subbarao’s residence in their last days..? ?..Did they literally see Goddess Gayathri on that day along with Subbarao..? ?..Or did Goddess Gayathri called her ardent devotees,who served Her all through their life with their Vedic renditions,there to Subbarao’s house to give them Her ‘Nija Roopa Darsanam’..
Who knows..? ?..And Who will answer these questions..??.. Please Click Here to read the “Shocking True Story Of A Mystic Brahmin Who Converses With Goddess Gayathri – Part Eighteen” ..